(October 10, 2013) On November 5, Mecklenburg County voters will have an opportunity to approve a $290 million school bond package that includes $8,964,000 to build a 20-classroom addition to Olympic High School and renovate the school's auditorium. The anticipated completion of the addition and renovation is January 2017. This would be the first phase of a comprehensive renovation of the school. The new classroom addition would provide swing space while the rest of the school is renovated later. During these additional renovations, approximately one fourth of the school's classrooms would be taken off line at any given time. Funding for the comprehensive renovations would come from the next round of bond money, expected to be placed before the voters in 2017. The following is from A Closer Look at The Proposed 2013 Capital Improvement Program. 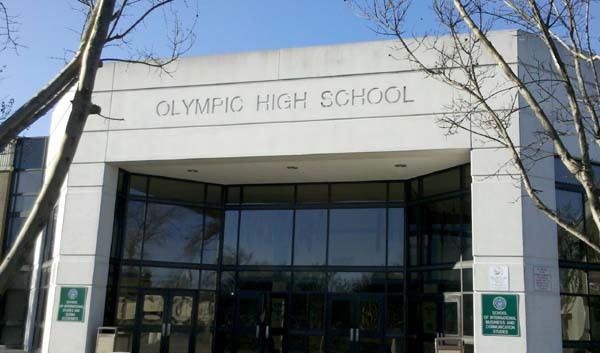 Olympic HS is a 90 classroom campus constructed in 1965, and currently houses 2260 students in five small schools. Olympic has not received any work to its educational buildings since 2000, and is well overdue for a comprehensive renovation. The first step in this process will be the construction of a classroom addition building to provide modern science classrooms and “swing space” for the work to occur within the main building. Updating of the auditorium will also be a focus. The classroom addition will increase the school capacity and reduce drastically the use of portables on the campus. The Olympic improvements are one of 17 projects in the $290 million bond request, which are intended to provide more academic options for students, relieve overcrowding, and renovate or replace facilities. Included in the projects are construction for a replacement school for Nations Ford Elementary School on the E. E. Waddell campus and a new PK-8 school to relieve Berryhill and Reid Park Elementary Schools. For more information on the school bonds, see the Charlotte-Mecklenburg School System's 2013 Bond Information web page. Also on the November ballot is a $210 bond package for Central Piedmont Community College. One of the 10 projects will add 150,000 square-feet of instructional space, including room for another CPCC-CMS middle college, at the Harper Campus on Hebron Street. See the 2013 Vote Yes For Bonds Campaign web site for more information on the school and community college bonds. Election Day is Tuesday, November 5. Early Voting begins on October 17 at Hal Marshall Annex and on October 26 at Steele Creek Library and 13 other locations. Early Voting continues through Saturday, November 2. See the Mecklenburg County Board of Elections web site.